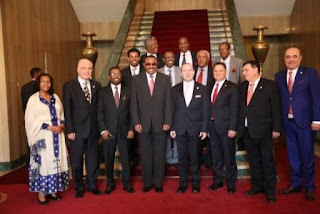 On 10 July 2015, on a special ceremony, in the presence of the Government of Federal Republic of Ethiopia, ambassadors accredited to the country and representatives of different international organization, H.E. 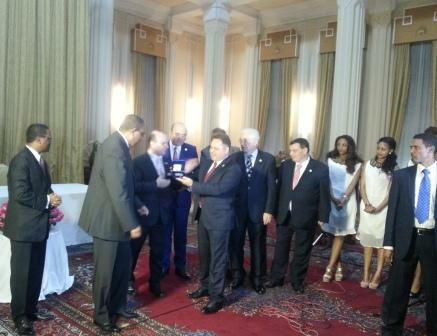 Hailemariam Desalegn-Prime Minister of Ethiopia received the Romanian Parliament Medal for his outstanding merits in international diplomacy and in obtaining for his country the accolade of WORLD BEST TOURIST DESTINATION and the sobriquet of FAVORITE CULTURAL DESTINATION. Hon. 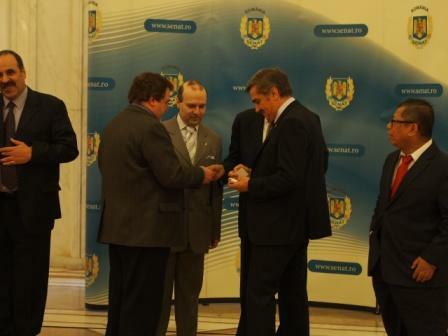 Senator Ionel Agrigoroaei presented ROMANIAN PARLIAMENT MEDAL for H.E. Prime Minister Hailemariam Desalegn. On 10th July 2015, in an official ceremony, Academician Mircea Constantinescu-Director of European Tourism Academy, had presented H.E. 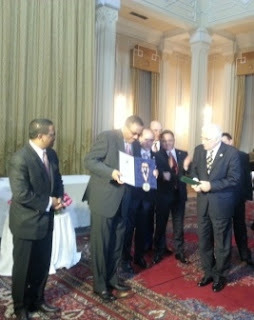 Prime Minister of Ethiopia-Mr. Hailemariam Desalegn with the insignia of honor and the certificate of honorary member of the academy. H.E. Prime Minister of Ethiopia-Mr. Hailemariam Desalegn presented with the insignia of honor and the certificate of honorary member of the academy. 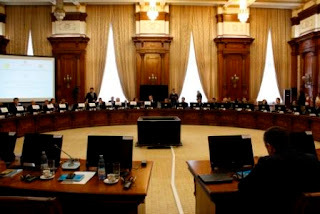 The decision was taken on 25 June 2015 by the Academic Board of European Council on Tourism and Trade and announced in an official letter as a result of: Government of Ethiopia recognizing the importance of tourism as a key facilitator for the country development and international promotion, creating exemplary structures like Tourism Transformation Council, investing in infrastructure and capacity building, creating a special team under Your Excellency leadership for destination promotion and management and protecting the cultural, natural and historical patrimony of the country. 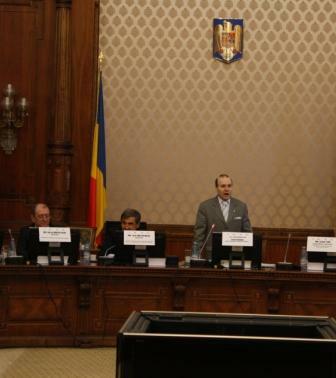 The full text of the admission in an academic institution is called laudation (from latin word-presentation) and we have the pleasure of presenting you with the text of laudation by Academician Mircea Constantinescu for H.E. 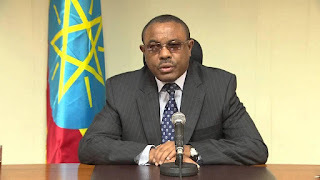 Hailemariam Desalegn-Prime Minister of F.D.R of Ethiopia. We are here to award to H.E. Hailemariam Desalegn, Prime Minister of the Federal Democratic Republic of Ethiopia the title of Honorary Member of European Tourism Academy. Analyzing the curriculum vitae along with the activity of the Prime Minister Hailemariam we discover a complex person, a man of many talents, entirely dedicated to the development of his country, to the well being of the people of Ethiopia, dedicated to building a favorable image of Ethiopia in the midst of the international community. His bachelor's degree in civil engineering, from Addis Ababa University, was fundamental for building a solid scientific education, giving him access to a high level knowledge and expertise. The master degree, with Tampere University of Technology in Finland, gave him an European and international perspective upon the transfer of knowledge, expertise and technology. Upon his return to Ethiopia, he served in different academic and administrative capacities, including the dean of the Water Technology Institute, for 13 years. H.E. Hailemariam Desalegn loves his country and the people of Ethiopia. He learned how important the water resources are for a country, how important the expert management of such a vital resource is for the well being and the successful development of Ethiopia. But for him it was not enough. He wanted more…He wanted to acquire knowledge of scientific management of the country, of its human resources and natural resources as well. We will not analyze here the political activity of H.E., but taking actively part in the political life of his country, it gave him the opportunity to work with people of Ethiopia, to be in the middle of Ethiopia’s people, to efficiently communicate, and being able to implement at the high level management of the country activities, reflecting the reality of Ethiopia and the wishes of Ethiopian people. His activity as Minister of foreign affairs was indeed a success. As a diplomat he presented to the world the image of a peaceful country, of many resources and beauties, with people that praise hospitality, open in a friendly manner to the international community. There is no wonder that with all these credentials H.E. was able to excellently perform as Prime Minister, running an activity at the top level, for the benefit of Ethiopia and Ethiopian people. In the country’s general framework, tourism is a complex activity, and H.E. understood that tourism is not only for tourists to enjoy the natural beauties and the cultural heritage of Ethiopia. Tourism is for also the people of Ethiopia, is for the development of the local communities, so that everyone will be able to enjoy all that a beautiful and resourceful country may offer. As a final remark, H.E. working for many years at the highest level of the African Union, was able to have a general overview, as well as a personal contribution, to the most important African institution, bringing together people and countries, managing the trend for ever growing development and international recognition of the African continent. In recognition of his contribution to the development of Ethiopian tourism, we are proud to hand over The Medal Of Honor to his Excellency Hailemariam, Prime Minister of the Federal Democratic Republic of Ethiopia and to recognize him as the newest academician member of the European Tourism Academy. 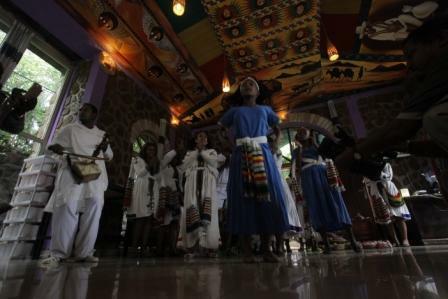 Amharic dances at celebrated traditional restaurant Four Sisters in Gondar. Gondar was founded in 1636 by Emperor Fasiledes. Starting this time on wards in became the center of modern architecture. As a result the first and the largest castle was built by the name of king Fasileded – “Fasil Castle”. Different castles and churches were built accompanied the grandest castle within an area of 70,000 meter square. The birth of such a modern architecture and start of urbanization enabled Gondar to be the center of arts, Orthodox Church education, crafts man ship, trade and exchange which stepped up Gondar in to a ladder to become and serve as a capital city of Ethiopia for more than 200 years. Gondar the home of a world heritage site since 1978 is 748 kilometers away to the North West direction from the capital city Addis Ababa. Many of Ethiopian’s impressive tourist sites are within a few hours drive. Bahr Dar, the Island monasteries of Lake Tana and the spectacular Blue Nile falls are within 180 kms to the South Gondar. The Semien Mountains National Park ( a world heritage site ) with its breath taking scenery and rare and endemic wild life is of only 140 kms to the north of Gondar. Its altitude ranges from 1900-4620 meters above sea levels it is the highest peak in Ethiopia and the fourth largest mountain in Africa. Besides Gondar has an easy asphalted road network access to both Lalibela ( the most striking feature and world heritage site ) to the west, Axum ( the world heritage site ) to the north and Gedarif ( the Sudanese city ) to the east respectively currently Gondar has a population of about 368,435 and hence I warmly want to say welcome ! So , we hope ! Planned and controlled expansion and growth of tourism will be achievable through enhancing and maintaining common interest and partnerships. Wish you a pleasant stay in Gondar. Hawassa is one of the most beautiful cities in Ethiopia, exploring the city is an enjoyable and worth while experience for both foreign and domestic tourists say`s Mrs. Almaz Beyero-Head of SNNPRS Tourism and Culture Bureau. 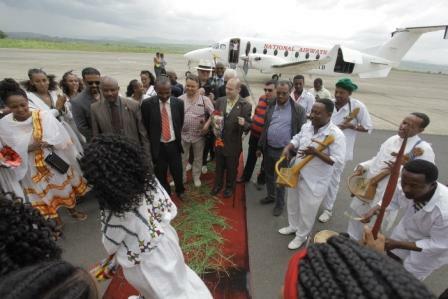 On 12th of July 2015, the European Council on Tourism and Trade delegation landed in Hawassa, for a short stay in the city of diversity, as the capital of South Nations, Nationalities and Peoples Regional State is widely known. At the arrival rostrum the high guests where welcome with a wonderful display of hospitality by Mrs. Almaz Beyero-Head of the local Bureau for Culture and Tourism and members of the tourism department and local mass media. The delegation enjoyed a tour of Haile Resort on the outskirts of the city, a boat ride on Hawassa Lake and a tour of the city landmarks with a special lay over at Sidama Nation Tower-Sidamu Summuda. On the occasion of the visit of European tourism body delegation Mrs. Almaz Beyero presented a welcoming speech destined to present the city tourists attractions and to lure more prospective tourists to the city. On behalf of the South Nations, Nationalities and Peoples Regional State, on behalf of the People of the Region, and on my own behalf, I would like to take this opportunity to warmly welcome you all to our region. 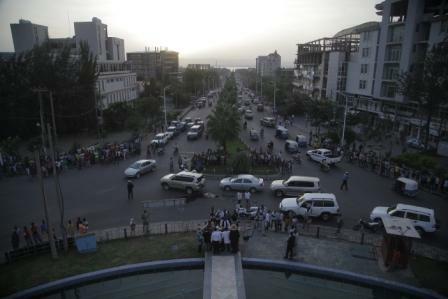 The region is one of the nine national regional states of Ethiopia. Our region encompasses diversified nations and nationalities, variety of land features and water bodies, and a wide range of Ecosystems. It is home for 56 nations and nationalities that speak more than 50 languages categorized under four language groups. These nations and nationalities have characteristic cultural values and an outstanding cultural performance that can attract the feelings of any outsider. Moreover, our diversity is exceptional by being our beauty and the power of our unity. 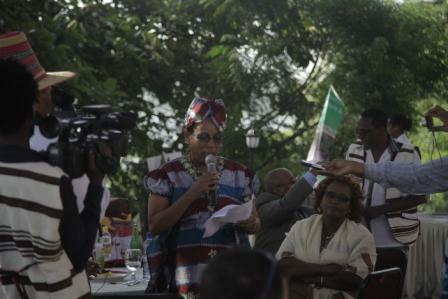 Mrs. Almaz Beyero-Head of the local Bureau for Culture and Tourism outlines the Hawassa city precious tourism patrimony. Geographically, the region is situated in southern half of the country very close to the international boundary, Kenya and South Sudan. The Great East African Rift valley, the prominent geographic feature of the region, is the home of more than four lakes that are accountable for enormous aquatic diversity. The significant altitudinal variation and consequent climatic variation of the region results in ecological diversity. Biological diversity in different life forms are maintained and protected in 7 national parks, 2 wildlife reserves, the crocodile ranch and many more protected areas. The region has unforgettable historical resources. It is known for old aged monasteries, mosques, palaces, caves, defensive walls, megalithic stele sites as well as archeological and paleo-anthropological sites. These historical heritages makes the region the owner of three UNESCO registered World Heritage Sites, one biosphere reserve and in which the best gift to the world , coffee is originated. There are many more intangible as well as tangible heritages that are in the pipeline to be registered as World Heritage Sites, the two are already registered under the tentative list. The regional government has been doing its best to develop, promote and properly utilize its cultural, natural and historical resources for the benefit of its people through tourism development and other means’s. As a result, the tourism sector has shown significant growth in the past two decades. Especially in the last one year the regional government developed tourism transformation plan and established Tourism Transformation Council in all administrative levels to integrate tourism in its all development agendas. Consequently, the region is able to witness positive development in the sector. 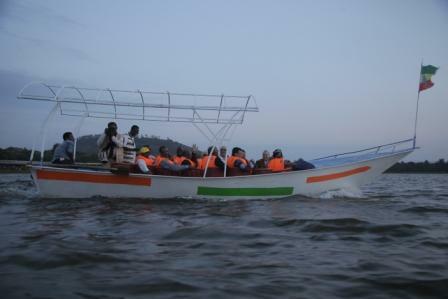 Hawassa lake: the heart and soul of the city of Hawassa and south Ethiopia. 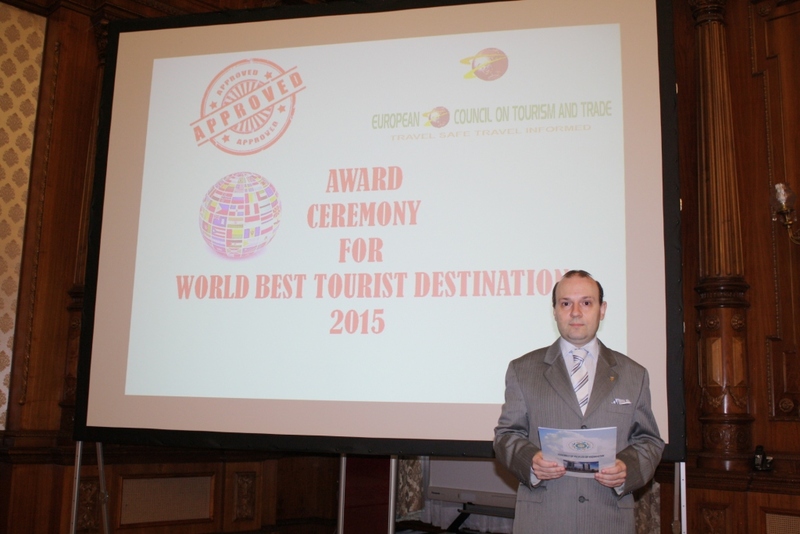 The selection and awarding of our country as The World Best Tourist Destination for 2015 by The European Tourism and Trade Council appropriately comply with our ongoing effort. This award not only insures the recognition we have at the international level but also used as a spring-board on our effort to transform the sector. Therefore, the regional government is very grateful for what you did and I hope your support will continue till of our plan gets real. Finally, I welcome you all again, and I wish you to have a nice and pleasant stay and enjoy the original taste of coffee, the hospitality of our people and their culture in our region, our city, Hawassa. A coffee ceremony and a musical display of Harari traditions where the secret weapons displayed by Harar Tourism Bureau-Muhyadin Ahmed to conquer the imagination of european tourism delegation visiting Harar. It seems that the gamble has pay off and the delegates were enthused by the city cultural potential. 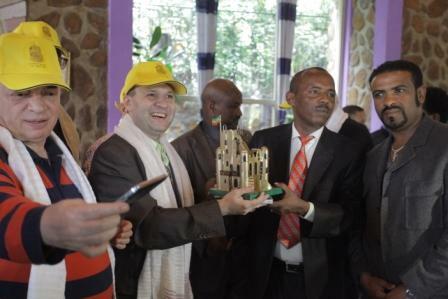 Harar-the city of peace and harmony, as is his UNESCO sobriquet, received the visit of European Council on Tourism and Trade President and his delegation on July 13, 2015. The delegation was welcomed by the Head of Harari Regional Culture, Heritage and Tourism Bureau Mr. Muhyadin Ahmed at the headquarters of the bureau. 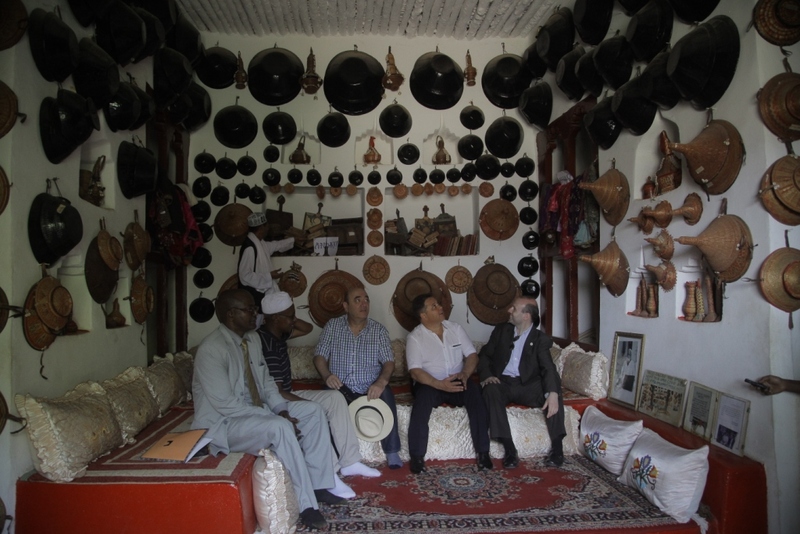 Visiting Harar (from left to right): Senator Ionel Agrigoroaei, President Dr. Anton Caragea, Head of Harar Tourism Bureau-Muhyadin Ahmed, Academician Mircea Constantinescu. Harar was built-in 7th century and is enjoying UNESCO world heritage status for his outer-wall called Jugal and build around 1552 and encompassing 82 mosques and 400 shrines that made the city being called Medinat al Awliya (City of Saints). European Council on Tourism and Trade delegation had the chance to visit the famous five gates of the city, toured Arthur Rimbaud famous house in the city, the palaces of Ras Tafari Mekonnen ( future Emperor Haile Selassie ) and traditional harari houses. 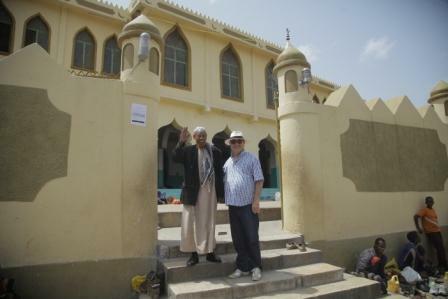 ECTT Trade Chairman-Mr. Mihai Prundianu visiting Grand Jami Mosque on Harar. 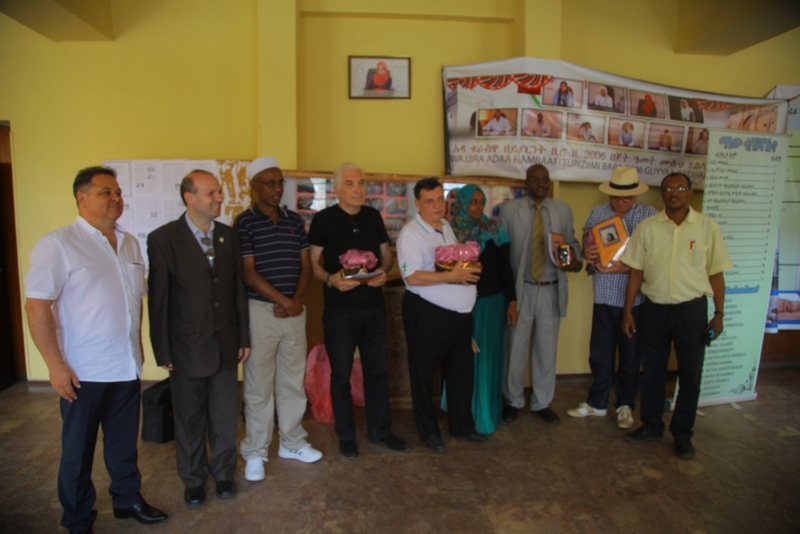 The delegation toured also famous Grand Jami Mosque and visited lodging facilities at Harar Ras Hotel. Harar is today a living museum of Africa, a city of unique features and a perfect place for the culture and history lovers, concluded at the end of the short, but impressive visit, Professor Dr. Anton Caragea- European Council on Tourism and Trade President. 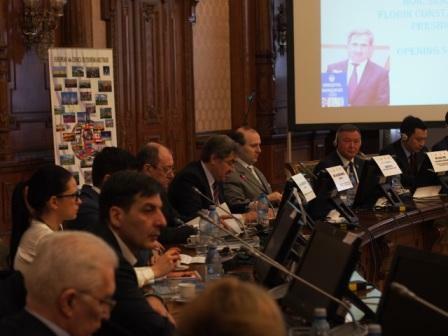 The meeting of world tourism leaders had chosen the clear and undisputed winner of tourism industry for 2015. The country that achieved international recognition is The Federal Democratic Republic of Ethiopia crowned as WORLD BEST TOURIST DESTINATION FOR 2015. Mr. Mihai Prundianu, Chairman of the Trade Mission of the ECTT, marked the necessity that, out of the regular order, to have another African country declared as WORLD BEST TOURIST DESTINATION in sign of continuity for last year and as appreciation mark forPresident Robert Gabriel Mugabe , the current President of African Union and Zimbabwe Tourism Minister-Walter Mzembi. 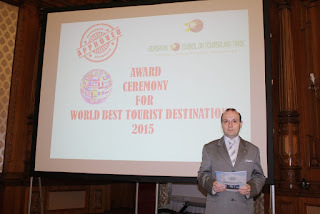 This statement and practical measures put in place, made your country succeeding in the 2015- WORLD BEST TOURIST DESTINATIONAWARD competition and be accepted as FAVORITE CULTURAL DESTINATION for your rich past and cultural prowess.